The 21-year-old from Kazakhstan beats Roberto Marcora in the final to lift his fourth ATP Challenger trophy. 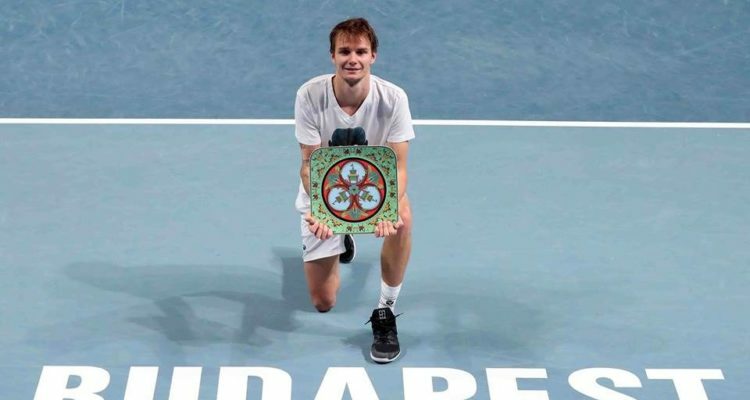 Alexander Bublik is the champion of the He-Do Hungarian Challenger Open. The No. 8 seed from Kazakhstan eased past Roberto Marcora from Italy 6-0, 6-3 in Sunday’s singles final at BOK Csarnok. Bublik saved the only break point he faced, converting five of his own six chances to seal victory in just 55 minutes of play. By lifting his fourth ATP Challenger trophy, Bublik earns €6,190 in prize money as well as 80 ATP-Ranking points. The 21-year-old will move up 28 spots to World No. 144 on Monday. “Solid week here in Budapest,” Bublik commented on instagram. Solid week here in Budapest. Earlier in the day, Kevin Krawietz from Germany and Filip Polasek of Slovakia took the doubles crown. The top seeds Filippo Baldi of Italy and Luca Margaroli from Switzerland 7-5, 7-6(5). The final lasted one hour and 23 minutes. This entry was posted in ATP Challenger News, ATP Challenger Tour and tagged Alexander Bublik, ATP Challenger Tour, Budapest.